The Center for Conservation Science and Restoration Techniques held the “IPM (Integrated Pest Management) Forum: 10 Years after the Abolition of Methyl Bromide Use: The Current Situation of IPM for Cultural Properties” on July 16, 2015. 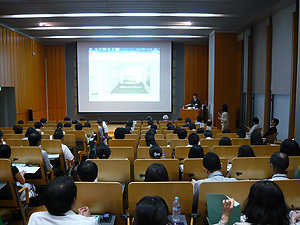 This event was jointly hosted by the Japan Society for the Conservation of Cultural Property, and was also held as a regular meeting of the society. This year marked the 10th anniversary of the abolition of methyl bromide use in and after 2005 decided by the Meeting of the Parties to the Montreal Protocol on Substances that Deplete the Ozone Layer. In this milestone year, we held the forum to review past activities, share information about the current IPM activities in the field of cultural properties, their progress and problems, and consider current challenges and the future direction. On the day of the forum, Mr. Takamasa Saito of the Cultural Affairs Agency, Ms. Rika Kigawa of the National Research Institute for Cultural Properties, Tokyo (NRICPT), and Mr. Sadatoshi Miura of the Bunkazai Chukingai Kenkyujo (research institute on insect and bacterial damage to cultural properties), respectively introduced fumigation techniques and subsequent IPM practices in Japan as well as countries around the world. In addition, various measures by individual museums were introduced from various perspectives by Ms. Mitsuko Honda of the Kyushu National Museum, Ms. Natsuko Nagaya of the Aichi Prefectural Museum of Art, Ms. Naoko Sonoda of the National Museum of Ethnology, Mr. Shingo Hidaka of the National Museum of Ethnology, Ms. Akiko Saito of the Natural History Museum and Institute, Chiba, and Ms. Mutsumi Aoki of the National Institute of Japanese Literature. Furthermore, Ms. Miyuki Asakawa of Ninna-ji temple introduced concrete examples of IPM activities in temples, while Mr. Yoshinori Sato of the NRICPT introduced an example of IPM practices at a conservation and exhibition facility for a decoratedtumulus, which is an environment for burial. 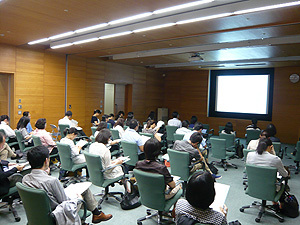 The forum was attended by 200 participants, and we set up two satellite venues at a meeting room (see photo 2) and a lobby in addition to the main venue at a basement seminar room of the NRICPT (see photo 1). In the lobby, we displayed copies of articles on IPM for cultural properties and measures against biological deterioration as well as related materials, and allowed participants to take them home for free. While it was regrettable that there was little time for discussion due to a series of heated presentations, we again appreciate that we could end the forum on a high note thanks to the cooperation from those concerned.